Please be sure to bring your membership card for check-in. Dinner will be available in the Double Eagle Café beginning at 5:30 PM. Meeting to start promptly at 7:00 PM in the Auditorium. The 24th Degree, “Brother of the Forest”, will be presented following a short business meeting. Don’t forget to bring your passports! Fellowship in Washington’s Retreat will follow the degree. 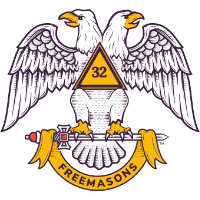 If you would like to join the Scottish Rite you must be a Master Mason in good standing. See one of the officers to get a petition. We will make you a 4th Degree member before the meeting.